Today’s post reacts to the news that next week, in the UK, workers will make history by staging a strike at two McDonald’s restaurants – one in London and one in Cambridge. The first strike of its kind in McDonald’s British history is a result of poor working conditions, the use of the infamous ‘zero-hour’ contracts, and a demand for an increase in the minimum wage paid to McDonald’s employees. In this post this particular story will be used a vehicle to cover an aspect that has almost become accepted in the mainstream media, unfortunately, and that is the concept of austerity and its repulsive effects. Whilst onlookers hope that the strike will see a revolution-of-sorts amongst the fast-food industry with regards to working conditions, the reality it is that the underlying causes of the grievances aired by the staff will remain whatever the outcome of the strike, as the problem is a systemic problem. The proposed strike, which is scheduled to take place on Monday 4th September, has been coordinated by the Bakers Food and Allied Workers Union (BFAWU), who argue that ‘McDonald’s has had countless opportunities to resolve grievances by offering workers a fair wage and acceptable working conditions… instead, they have chosen to ignore their workers by tightening their purse strings [and] filling their CEO’s pockets’. McDonald’s, in response to the forthcoming strike, stated that workers would be offered contracts that guaranteed them a minimum number of hours per week (although this was stated in April of this year) and that they have increased their average hourly rate by 15%. Nevertheless, the strike in the UK is being billed as just one component of a global effort to enforce change in the sector, with the strikers’ actions being linked to the ‘Fight for 15’ movement in the US, which is also endeavouring to usher in a new minimum hourly wage of $15 for employees in the McDonald’s’ home country. News stories in the media today have been quick to highlight the plight of workers in this sector, making the point clear that workers are often drafted in quickly and as young as possible, owing to the lower wage demands for those under 18 and under 21. Additionally, at least one commentator has described how this ‘McStrike’ can be the catalyst for change if the right strategies are engaged, with the hope that, eventually, the country will fall in line with the recent developments in New Zealand where zero-hour contracts have thankfully been banned. However, at the same time, the BBC reported today, via a survey, that ‘four in five British adults are “proud” of the work they do’ – clearly something is amiss, and the BBC’s timing could not have been worse. These strikes, and the general underlying sentiment of workers battling against the system for some variant of equality (which, in itself, is an incredible sentiment), are the direct consequence of the population being punished by the blight that is austerity, with one of the key aspects to that assault – uncertainty – coming to the fore on each and every instance; however, once we realise that uncertainty is the precursor for much more serious problems, the effects of the Crisis become unmistakable and undeniable. Uncertainty is a common factor faced by the poor across the world, with that dynamic being increased substantially since the Crisis and the resultant extraction of wealth took place; whilst it has been argued that ‘uncertainty is inextricably enmeshed with human existence’, uncertainty is often a precursor to stress as a concept, which then has an overwhelming tendency to form the onset of ‘physically illness and psychiatric disorders in individuals of all age groups’. Accepting these admittedly cursory statements for just one moment, it is clear to see that ‘zero-hour’ contracts are the absolute demonstration of the corporate creation of individual uncertainty, with the ensuing consequences being of no great surprises whatsoever. University College London found earlier this year that 25 year-olds on zero-hour contracts were 41% less likely to report having good physical health, with those workers being one-and-a-half times more likely to report having a mental health problem (with the concept of one even being able to report a mental health problem being another issue entirely). Despite calls for managers and bosses to be more sensitive and vigilant to this increasing rise in mental health deterioration, the problem is a persistent one, and there is a simple reason for that. Zero-hour contracts and low pay are symptoms of the wider assault of austerity, and that assault has claimed many victims. It is no exaggeration to support the notion that what we witness today is akin to a ‘mental health crisis’, with a 20% increase in demand for mental health services recently being met with cuts for those services across the board, including the redirection of funds that were so proudly affirmed by the Prime Minister, only then to be crudely taken away. The increase of these problems in relation to the biting reality of austerity is incredibly charted by The Independent who describe how over 17,000 children were admitted to Accident & Emergency in 2013-14 alone, compared to just over 8,ooo in 2010, with what is labelled as ‘psychiatric conditions’. Additionally, the Psychologists for Social Change initiative, working under the ‘Psychologists Against Austerity’ banner suggest that there are 5 specific ways in which austerity impacts upon mental health, with those being: humiliation and shame (linked to the disgraceful treatment of benefit claimants, particularly since the Crisis); fear and distrust (the initiative discusses how the DWP have been reprimanded for their manipulation of statistics to promote negative views about benefit claimants); instability and insecurity (almost 700,000 workers are on zero-hour contracts); isolation and loneliness (cuts to services have alienated the elderly and vulnerable within society); and finally the feeling of being ‘trapped and powerless’ against the incessant waves of governmentally-created policies designed to force the public to pay for the crimes of the powerful. This onslaught has resulted in the largest annual spike in mortality rates in over 50 years in the U.K. – the correlation between statistics like these and the onset of austerity is clear to see. Yet, there is one particular element which deserves attention in light of the forthcoming strikes in McDonald’s, and that is the ‘workfare’ initiative. Whilst ‘workfare’ as a concept and, dare one say an ideal has a long history, its re-emergence in the post-Crisis era was to be expected. The Conservative-inspired version is based on the concept of encouraging people into work by developing a small carrot and large stick regime, with the small carrot being unsatisfactory and low-paying jobs, and the large stick being a marked increase in the use of ‘sanctions’, as well as a revolution in how job-seeking benefits are administered and monitored. The reason this is raised is because the government have struck deals with employers across the country to be part of the workfare regime, although they have attempted to make that register secret. 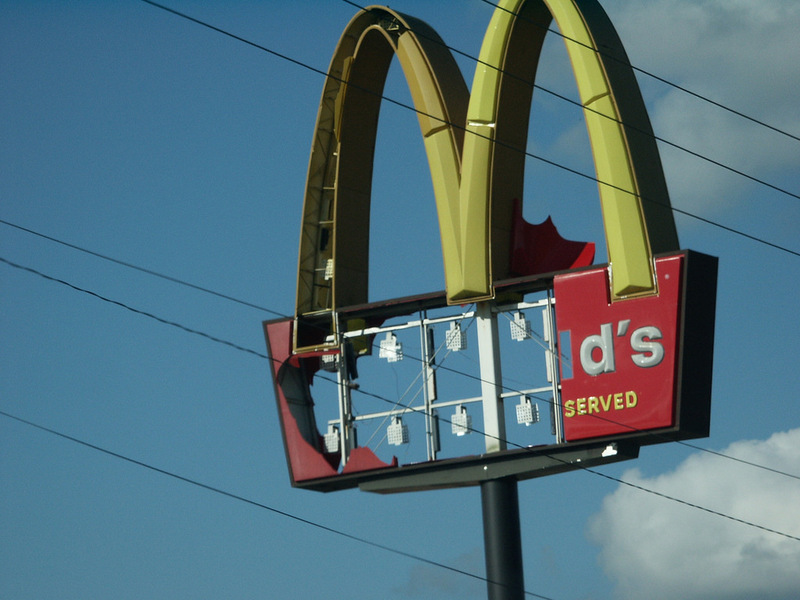 Yet, we know that McDonald’s is a member of the regime, which stands as just one example of the government creating a narrow avenue for the vulnerable and those in need to be funnelled into a system that simply has no consideration for their plight. Not only is this system inhuman, the government are actively allocating psychologists to jobcentres to rate the claimant’s ‘attitude to work’, with poorer attitudes becoming the basis for deciding whether one should be entitled to benefits or sanctioned – a study by Durham University found that unemployment is being ‘repackaged as a psychological problem’, which results in a diversion of attention from the underlying causes of the job market’s malaise and ‘any subsequent insecurities and inequalities it produces’. The study argues that the focus on the psychological effect of sanctions ignores the unfairness and inappropriateness of sanctions, which is correct, but we must also then state that those in receipt of job-seekers allowance or another variant, who may then fail the requirements for that particular benefit, will then be funnelled into disability-based benefits, if they are lucky, which as a system has become systematically punitive since the Crisis. The attribution by some of the concept of a ‘workfare state’ is, unfortunately, an accurate representation today. Ultimately, the justified strike that will take place in the two McDonald’s restaurants next week are just a miniscule consequence of one of the largest assaults in society that has been witnessed, and one that continues. Seemingly, because we inhabit this era, this post-Crisis era is often downplayed or contextualised in a certain manner in a way in which an era like the one that hosted the Great Depression is not. Yet, if we really reflect on what we are witnessing today, then this era is no better, and in all likelihood will be remembered by history as being worse. This is because of factors like in 2017, with the technological advances and apparent increase in the distribution of wealth – which, although seems obvious has been debated and critiqued greatly – we are still seeing excessive increases in the rates of poverty, homelessness, mental health problems and mortality, and that is just in the Western World. Whilst the era of austerity will forever be a blight on the reputation of all those who developed and support it (the Conservative party have rightly had their reputations cemented for this), the Labour party’s (‘New’ or otherwise) facilitation of the Crisis must never be forgotten – there is one important element to take from this understanding, and that is to focus on the division between the political parties is simply too narrow a focus. The division between the powerful and everyone else is perhaps the ultimate focus, and it is sorely lacking in modern discourse.